leftairm curled inta her richt airm. der aa dere: young an unwörn. a pebble, whit micht a bön a blade. an nae sign o a lover. wi a rikkel o mintie banes. Twa steyns at da head, een at da fit. da tidder, left airm across mi bosie. fur tree score year an ten. But I still draem lik a pagan. apairt. Wha kens what ailed dem? Did da Great Frost Winter tak hits toll? apö der backs, haands likkly crossed. outlived da midder an faider. Foo lang do fock live fur? Hit’s no nearly lang enoych. Shetlandic is my mother tongue and I generally write more than half my poems in it. Although I enjoy writing in English too, I find Shetlandic closer to my emotional core. It is resonant with percussive consonants and soothes with long vowels. What it lacks in abstract nouns it makes up for in onomatopoeic richness and general sound quality. Shetlandic is arguably the most distinctive variant of Scots; a product of its history. The island group was part of the Norwegian- Danish kingdom until the late 15th century when it was pawned to Scotland as part of a marriage settlement of the Danish princess; she was to marry the future King James III of Scotland. The language spoken for centuries had been the Scandinavian Norn, and although that was eventually superseded by Scots, the old language still lingers in the sound, the structure and much of the vocabulary. However as technology changes, language attrition speeds up. Today the ‘dialect’ lies unselfconsciously on the dialect-language continuum. 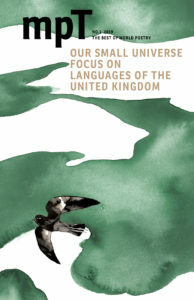 There is a small and growing literature in Shetlandic, particularly poetry. This poem, ‘Dis Life is Nivver Enyoch’, is a meditation on our coming to terms with the relative brevity of our lives, both as individuals and in relationship. The three sections, all set in Reykjavik, span from pre-Christian times to the here and now of our relatively long lifespans. I wrote it while visiting Iceland recently to launch a bilingual collection.